After many years of uphill struggle, construction of the boat launch on the Coginchaug River adjacent to the City’s recycling center is complete. The Jonah Center wants to thank the members of CRAG (Coginchaug River Access Group); Joe Samolis, Chief of Staff for Mayor Dan Drew; Bill Russo, Director of Public Works; and Michiel Wackers, Director of Planning, Conservation, and Development for the critical roles they each played. Pat Munger Construction Company in Branford was the contractor. The most critical part of the launch, the paved ramp leading into the water, was completed in the fall of 2014. Other amenities such as information kiosk, paved turnaround, and solar lighting, will have to wait until more funds become available. 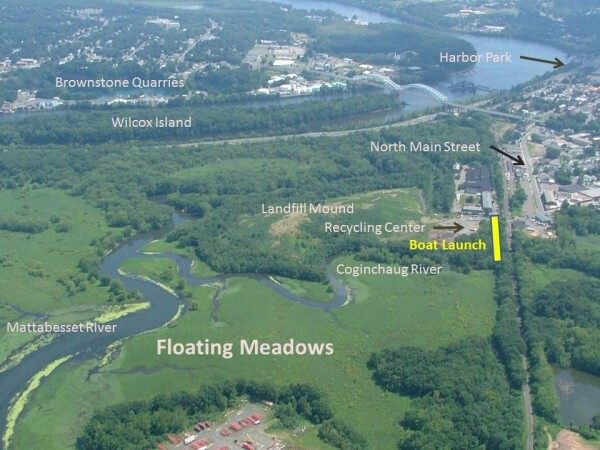 To use GPS navigation to locate the launch site, enter 181 Johnson Street, Middletown CT.